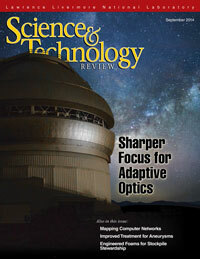 Advanced adaptive optics systems are sharpening the images taken by large telescopes and being designed to better focus x-ray beams. A software tool for mapping computer networks offers situational awareness for enhanced cybersecurity. A Livermore collaboration with Texas A&M University is combining high-performance computing and advanced materials science to improve aneurysm treatment. Additive manufacturing is helping engineers create improved silicone cushions for stockpile stewardship applications.